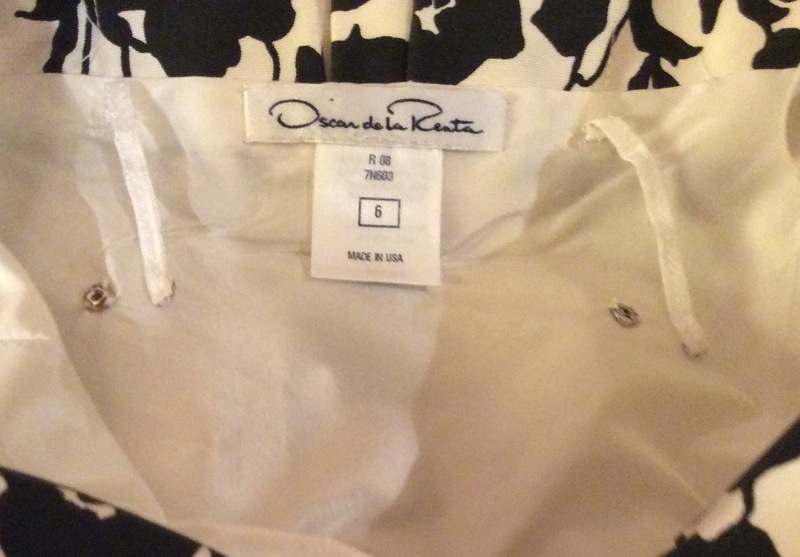 I want to share my experience of getting up close and personal, inside a RTW Oscar de la Renta designer gown scored at an estate sale. And what a pleasure it was. First, because it reinforced everything I’ve learned over the years. And, secondly, because it showed that I am fully capable of sewing a similar gown–if I so chose–thanks to my sewing education. I can’t begin to list all the teachers who have contributed to my sewing education as I began sewing at 10, so first credit goes to Mom; then Junior High Home Economics classes, on to College of Home Economics, University of Minnesota, and, the most important, The American Sewing Guild, established in 1978. I am a charter member of the Minneapolis/St. Paul Chapter of the American Sewing Guild, the third chapter of the national organization organized in 1979. Through ASG, I, and all my fellow sewing enthusiasts, had/have access to terrific educators; some are national personalities; others are regional and local. All are marvelous educators! By the way, the ASG tag line is Advancing Sewing as an Art and a Life Skill. How appropriate; it is an Art and something I can continue to practice and enjoy even though various body parts don’t function so well. The bionic knee does bend enough to use the sewing machine foot pedal. Yay!!!! 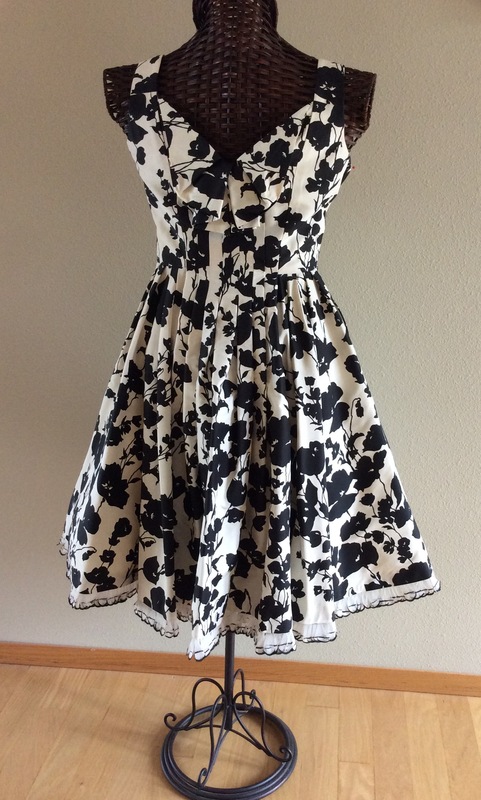 This is a what I would call a cocktail dress; that’s what we called them in the 60s. It’s a special event gown from Oscar de la Renta. Don’t have a date but the feather trim indicates a recent date. Perhaps someone recognizes a code on the label to date the dress. 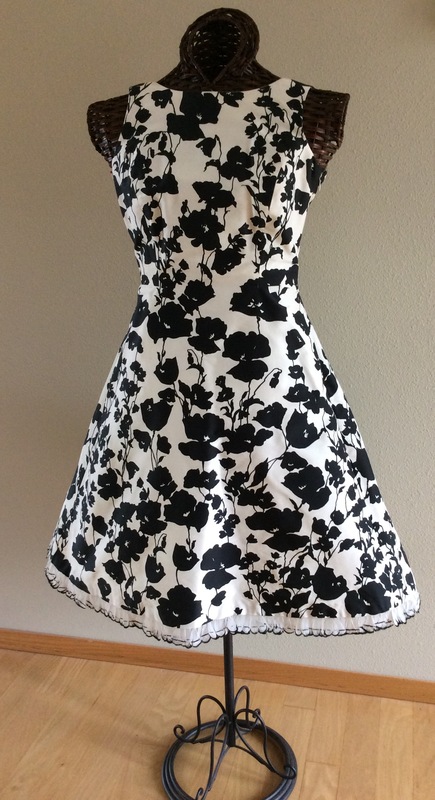 The fabric is a silk faille lined in a silk taffeta. There are no fiber labels so am assuming Silk due to the ‘feel’ and ‘look’. Sorry, didn’t due a fiber test. The gown back is a panel running from top to bottom. It is shaped with tucks that are unstitched at the top and then folded down to shaping a V back and a clever, yet simple, embellishment. The tucks are stitched to the waist and left open to hem forming a subtle bustle effect. Back tucks folded up to reveal un-stitched portion. Note the side waist seam that continues around to the front where a plain front panel runs from top to bottom. The front and back panels contribute to princess seam shaping. This is the back of the gown showing the taffeta lining. 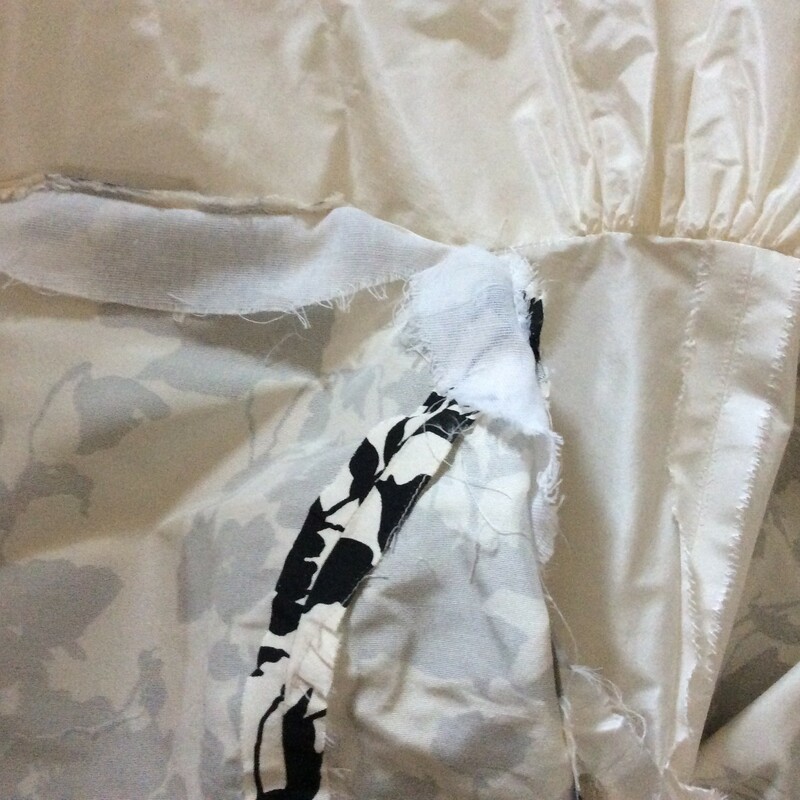 The lower third of the skirt lining is a separate piece stitched to main lining to protect the wearer from the stiff horsehair braid which is between the gown and this piece of lining. The gown is closed with an invisible underarm zipper. Under the protective (next to body) lining. 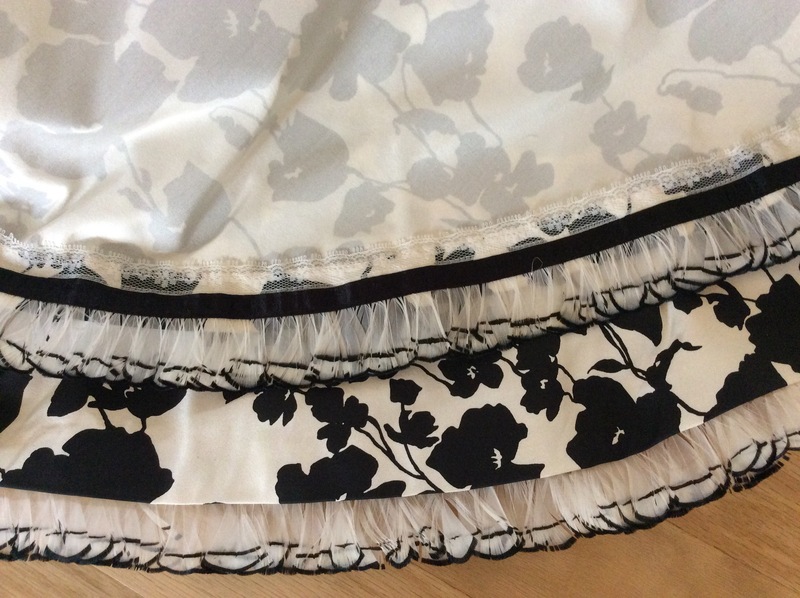 This is the part of the lining that maintains the skirt fullness. Closeup of wide horsehair braid encased in the lining hem. This supports the fullness of the skirt–thus the bell-shape of the skirt. Other inside support–full lining, waistline stay ribbon that hooks together over the zipper. Interfacing at front neck and armscye is a loosely woven gauzy fabric, cut on the straight grain–see raveled edges. Couldn’t get into the tucked back neck but doesn’t feel as if there is any interfacing. Remember, this is a very firm, crisp, stable fabric. 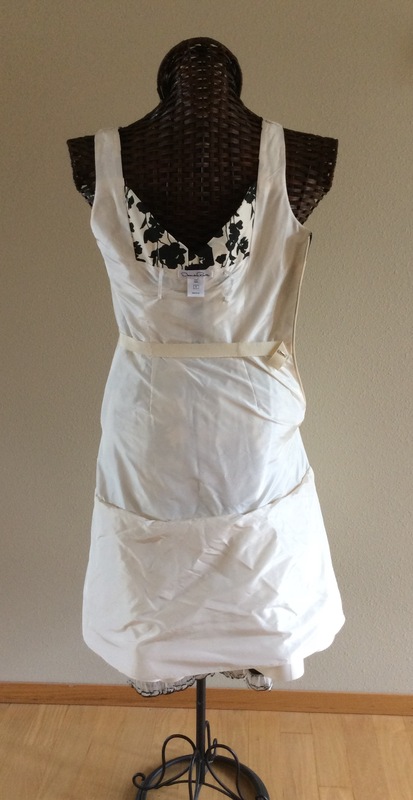 In this photo, the top of the garment is folded back over the skirt lining to show seam finishes–none. Although the one lining SA on the Right does appear to be pinked. Other SA were 5/8″ and raw–read as lots of fraying. Also see the unclipped threads! Yes! I very seldom neaten up the inside of my garments, especially if lined. 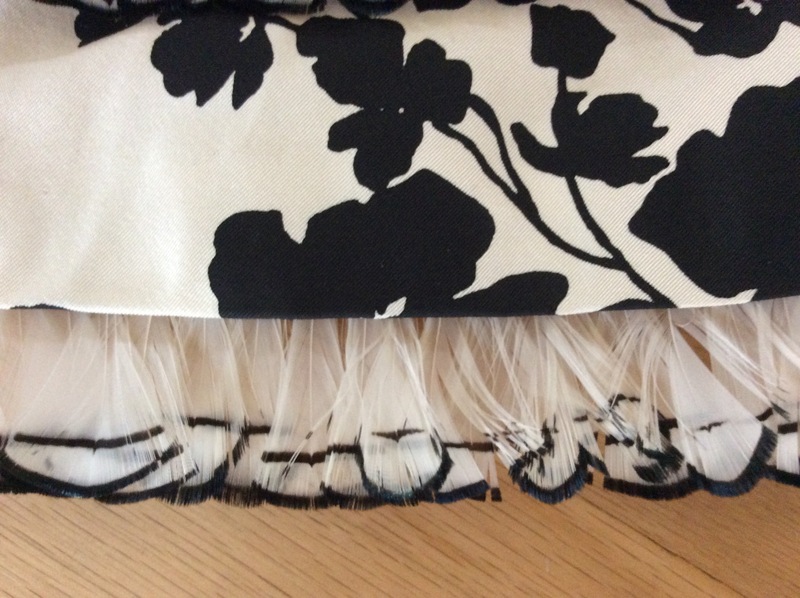 Feather trim is finished on inside with hem tape and lace hem tape; the lace is hand-stitched to faille. No stitches show through to right side–the beauty of faille. How practical–tissues, keys, cash, iPhone–would fit…but, maybe not a good idea. There are times when we just need to disconnect. 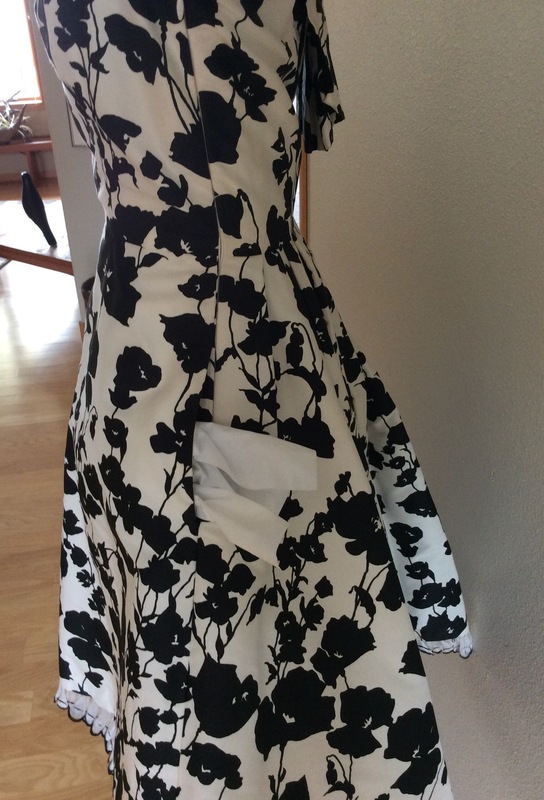 Made a summer dress with pockets and Love them. Will now include whenever practical. Would really like to hear about your forays into RTW Designer fashion. Please share as we all learn from How It’s Made. 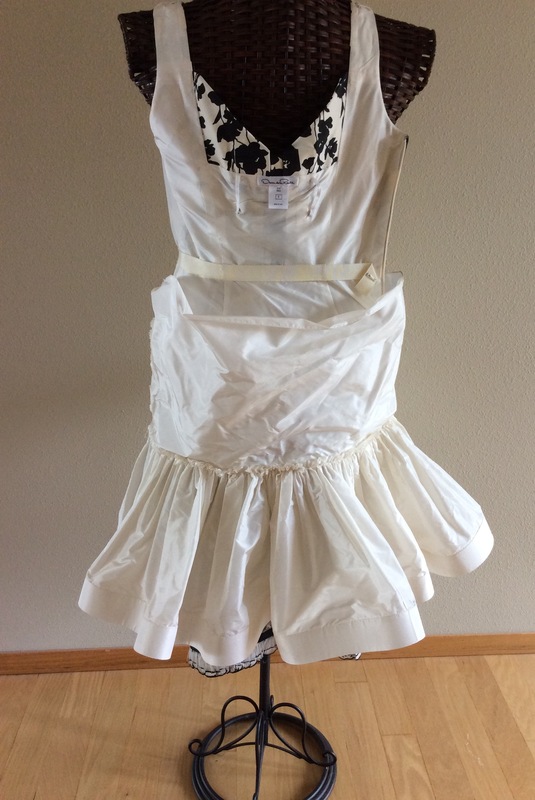 This entry was posted in FIBER FASHION FUN and tagged ASG, faille, horsehair braid, lingerie guide, Oscar de la Renta, RTW Designer, waiststay. Bookmark the permalink. What an interesting post. I especially like those stitched down pleats in the bodice.